I have crossed into enemy territory. That's right, yesterday, for the first time ever, I crossed the German border and went into France. Albeit Alsace, "the least French of French regions," according to my guide book. This is a beautiful territory to the west of the Rhine river across the valley from the Schwarzwald - the Black Forest. Joycelyn and I will spend the next couple of days touring Alsace, but we started in Strasbourg. Strasbourg is one of the three capitals of the European Union. Don't bother going to the EU section of town, stick to the Old Town area. Old Town is an island formed by a fork in the Ill river, and is a quaint area dominated by the old Cathedral, and with numerous half timbered houses (Fachwerk), canals, locks and bridges. 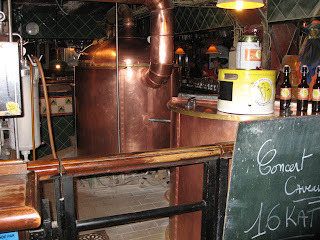 Alsace is know for its wine, but I was able to find one micro (artisan) brewery in town - the Au Brasseur. It is located at 22 Rue des Veaux, about three blocks west of the Cathedral in a quiet, fairly non-touristy section of Old Town. They offered four beers of their own; La Blonde, Ambree, La Brune, and La Blanche. First I tried the Blanche. I was not sure what to expect with this wheat beer, but after the first taste I could tell it was of the Wit style. It was pale, cloudy and very tart with some definite sourness. A very good representation of the style. My second beer was the Brune. This beer was made with a touch of chocolate malt, and was a clear dark amber, fairly clean tasting, but also with a very slight tartness. I'm not sure if the two beers shared a common yeast strain or not. School doesn't get much older than the brew house. It was in a very small sunken area surrounded by the bar. Crammed in that area was a well used two vessel system. The pumps looked ancient, but the tuns were well kept. I'm not sure how old it was, but it did not look modern by any means. The mash and lauter tuns were fairly small, probably a 10 barrel system. Malt rakes and shovels hung behind the bartender. 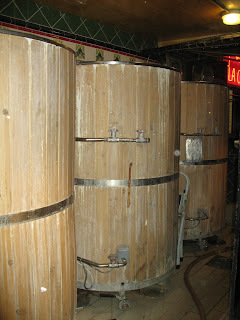 They also employed what looks to be an open fermentation system. I did not research the history of this brewery, and our bartender did not speak much English, so I can't give much for details. I've inserted a couple of pictures for you. The place reminded me of some Belgian brown pubs I've visited, though with less flair when it came to their beer presentation. (For example, naming their beers simply Blonde, Ambree, Brune and Blanche.) But a very nice, though tight, atmosphere. They served pitchers of beer, which I don't ever recall seeing in Europe. And lots of them. The Au Brasseur was definitely popular with the locals. The ancient cellar downstair was converted into a tight beer hall, with numerous picnic tables, and a stage for jazz and blues bands at the far end. We had just arrived from America, and were pretty tired, so we retired to our room instead of staying for the music, but it felt like the atmosphere would be buzzing in a couple of hours. If you get a chance to visit Strasbourg, I recommend hitting the Au Brasseur. And if you do please let me know what you think of the music and their Blonde and Ambree that I did not get a chance to try. Sounds like a great trip so far! It was good to see you at the Hardeggers and we'll look for you at the Wynkoop.